A new Panorama gallery for stitched images has been added. A large sized 'Photo of the Month' image has been added to the main index page. Some of the galleries were becoming too full so I have removed some of the weaker images. I also removed some 'duplicates' that were too similar to others. This is another painting loosely based on a portrait by the American painter Daniel F Gerhartz but with the head taken from a photograph of different girl. It has taken many months to complete but is now ready to be varnished and framed. The heavy snow towards the end of the month created some amazing 'Christmas Card' landscapes. Annoyingly, I was working away from home that week: I found myself snowed in and unable to get to my camera gear. I had to make do with a low resolution Sony 3Mpix compact. Most of the local roads were not gritted and dangerous. It was over a week before I was able to get home. Venturing out in a car, especially without 4WD was too risky, so I was restricted to visiting places within walking distance. After getting caught out without a camera during the snow, I decided to buy a compact camera to keep with me. I looked at the Canon S90 and the G11. Both cameras have a similar specification and a similar price. The S90 has the advantage of being more compact and so easier to carry in a pocket. It also has a faster f2 lens compared with the f2.8 in the G11. In the end I decided on the G11 because it has a slightly longer zoom range and, more importantly, can accept a remote shutter cable for use when mounted on a tripod (useful for sunsets/night shots or macro). The Vari-Angle LCD on the G11 may also prove handy in awkward situations such as shooting near the ground or when the camera needs to be held above the head. I stitched together a series of images of Park Cottage at The Lee in snow. These were shot using the Sony compact camera without a tripod. Nevertheless, the stitching software did a pretty good job. The 2009 Parks Trust Photo Competition. I was pleased that my image of sunrise over the Ouzel Valley Park taken in Feb 1998 won the landscape category in the recent 2009 Milton Keynes Parks Trust Photography Competition. This was shot using Fuji Velvia 6 x 4.5 and scanned using an Epson 4870. 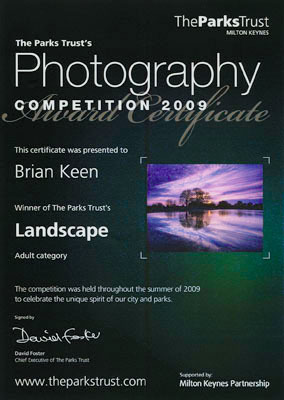 Although not the overall winner, the image appears on the front cover of the 2010 Parks Trust Calendar. Visited the narrow gauge railway 'Stonehenge Works' in Leighton Buzzard. Luckily, visitors are pretty much free to wander around even though restoration work on locomotives and wagons was being carried out. Found some interesting pattern and detail shots of chains, rusting metal and flaking paint on the old railway wagons. There are some old WW2 ammunition boxes and a couple of old bombs on one set of wagons. Took a couple of shots of a row of buses through the fence at the yard in Tilsworth. Unfortunately snagged and ripped a small hole in my expensive Paramo trail shirt on the sharp fence posts in the process! At last managed to get a reasonable pictorial shot of a Grey Heron on the banks of the Grand Union Canal. I would have liked to have been a bit closer but, as usual with Herons, it spotted me and flew off before I could get near. The image was taken with a 200mm lens (300mm equivalent for the DX sensor on the D200) using a tripod and looks reasonably sharp. Early Morning Mist - Cobwebs & Barges. Had some sun and mist early one morning. Tried to capture some close-ups of back-lit cobwebs covered in dew using black card as the background. Results were ok but sharpness is a problem because of movement caused by the breeze. Captured a nice shot of a barge on the Grand Union Canal moving under a bridge with autumn leaves back lit by the early morning sunlight. Took a walk though Tattenhoe Valley Linear Park in MK. A nice sunny day and a pleasant walk, but not much success from a photographic viewpoint. Quite a few Red Darter Dragonflies on the wing laying eggs on the water. Also a Grey Heron and Kingfisher. All just about impossible to photograph. Had to make do with some autumn colour reflections in the stream. Visited Stockgrove Park near Heath & Reach with my Bronica medium format camera. I used a couple of rolls of Reala 120. There were some nice looking shots of back lit trees at the water's edge. I finally got round to stitching together a sequence of images of Berufjord in Iceland to create a large high resolution 180° panorama. I used Photoshop's Photomerge tool. The result been uploaded to the gallery website along with the 'ptviewer' java application required to view and pan around the resulting image. I decided to go back into the darkroom and do some traditional RA4 colour printing. This was partly because I wanted to use up the 4 packs of ten 12x16 Fuji Crystal Archive paper I bought at a knock down price when Jessops closed their shop in Central Milton Keynes. The paper was 2 or 3 years old but had been kept in my fridge, so I hoped it was still usable. I ordered a 10L kit of RA4 chemistry from Nova. When the chemistry kit arrived and I filled my Nova tank, the first problem was remembering how to calibrate the Micro head on the Durst Modular 70 Enlarger. The instructions for the Durst Micro head are some of the worst I have ever encountered. It is extremely complex to use and the human interface is very cumbersome. Calibration involves making test prints from a test negative of a grey card supplied by Durst and making adjustments to the filtration and exposure time to get the resulting print both a neutral gray and the correct density. As soon as I started the calibration procedure, I realised that the old paper was unusable. Some packs had a buff/dull cream cast on unexposed paper after processing, others had a magenta cast. With some annoyance that my 'bargain buy' turned out to be rubbish, I threw the lot in the bin. After looking on the web for more paper, I discovered that Fuji Crystal Archive is no longer available in cut sheet form. The only alternative was Kodak Supra Endura paper. I ordered a box of 50 12x16 sheets of semi-matt from Morcophoto. It works out at around 60p per sheet, not including the cost of the RA4 chemistry. When the new RA-4 paper arrived, it took me the best part of a day to calibrate the filtration and density settings for both the Durst Kodak Gold test negative and my own test negative for the Fuji Reala film I normally use. The first print was from a medium format negative of bluebells in Ashridge shot using a vaseline filter. I had already printed this digitally using my Epson 1290, but the result looked pretty awful. My first attempt using the calibrated filter settings was too light and too red. The bluebells looked pink rather than blue. I had to increase the Yellow and Magenta filters considerably from the calibrated values to take out the red cast. It took five sheets before I finally arrived at a print I was happy with. One sheet was spoiled by a strange out-of-focus purple spot about 1cm in diameter. After puzzling over the cause, I realised I must have put the unexposed sheet too close to the small green LED on the enlarger probe after removing the paper from the box. Despite not being able to make contrast adjustments when printing using RA4, I think the final result looks considerably better than the equivalent inkjet print from the Epson 1290. Perhaps it's time I invested in a new, more up-to-date inkjet printer with pigment inks. The trouble is, the inks are so expensive. Even though it's only late September, the autumn colours on some trees are already starting to appear. There has not been much rain this month. There have been quite a few sunny days with blue skies, high clouds and some good light for photography. I managed to shoot a few local images. I had some free time this month, so decided to add a new 'EXIF' import feature to my database. For images from digital cameras, this allows me to automatically import details such as camera and lens settings, date and time etc from the original image file (NEF, JPG etc). The number of images from the recent Iceland trip meant that entering the details manually became a time consuming chore and was error-prone. I used 'exiftool' along with some Visual Basic to read the EXIF tag data. While using exiftool I discovered that it reports the wrong manufacturer in the lensID strings for my Nikon 105mm macro and Nikon 12-24mm DX lenses: The macro lens indicates 'Sigma', the 12-24mm DX gives 'Tokina'. I believe this is because some 3rd party manufacturers have used the same lens ID numbers. I got round the problem by adding an 'ExifName' field in my 'lenses' table in the database. This allows me to map any EXIF lensID string to the correct lens details. I decided to relocate the recent Whipsnade images into a new 'Colour, Animals' Gallery: The animal photographs did not seem to belong in the 'Beds, Buck, Herts' landscape gallery. At over £18 admission fee plus £3.50 parking, a trip to the zoo is not a cheap day out. The day was disappointing for photography and I didn't manage to capture anything exceptional. I prefer landscapes: Animal and bird photography is not really my thing (Although I do sometimes shoot close ups of flowers and insects). The weather was hot and sunny which meant a lot of the animals were either sleeping or inside; including zebras and the big cats. Static pictures of animals just standing around or sleeping usually end up looking pretty boring. The best photo opportunity was probably in the lemur enclosure. There are no cages in the way; the lemurs are used to visitors so you can get quite close. Despite this I still failed to get a decent shot - I spent too much time fiddling around with the tripod when I should have been shooting hand-held. This month I took a 12 day photo trip to Iceland with Quest Photography run by Colin Westgate FRPS. The scenery in Iceland is very dramatic and it is somewhere I have been wanting to visit for a long time. The pound/kronur rate was quite favorable because of the credit crunch, but the cost of living is still expensive because of the amount of goods that need to be imported. There were a total of 7 photographers in the group including myself. We toured the country in a hired minibus, staying in pre-booked hotel accommodation. Food in the hotels was good but expensive - averaging around £25 for an evening meal. Desert and drinks such as beer or wine were extra. Choice was limited to fish and lamb (occasionally chicken). The Icelanders do grow some salad and vegetables locally in artificially lit heated greenhouses. Luckily most of the Icelanders can speak good english, so language was not a problem. Hot water is generally piped from underground hot springs and has the characteristic smell of sulphur. The days are long at this time of year. It never seems to get really dark and sunrise is around 4:30am. We had a mixed bag of weather including showers, rain, snow, blizzards and extremely strong winds. Temperatures ranged from 10 degC to -4 degC (excluding a very high wind chill factor). The cold wind caused the skin on my fingers to split - it is not always possible to wear gloves and operate a camera at the same time. My photo kit stood up to the conditions pretty well. The only thing I regret not taking with me was my 105mm macro lens. This would have been useful for close ups of lichens on the glacial rocks and for the mineral patterns near the geysers. Flew from Heathrow to Keflavik airport, picked up the minibus and drove to Gesyir via Pingvellir. The minibus broke down on our first photo stop en-route (a suspected alternator fault) and the minibus had to be replaced. The replacement had the advantage of 4WD but the passenger door catch was faulty and could not be opened from the inside. My attempts to open the door by putting my arm out of the window to operate the handle resulted in a strained elbow muscle that plagued me for the last half of the trip and for some weeks after. The photos I took of some stunted birch trees at the first stop were not that good. I got up early to photograph the Strokkur geyser against the sun. Strokkur erupts at around 5 minute intervals. Continuous shooting mode on the D200 was very useful in this situation. The sun was a bit too bright and needed exposure compensation to prevent highlight burnout. We also shot some close-ups of patterns made by mineral deposits around the base of the larger extinct 'Great Geyser' nearby. Drove a circular trip around Pingvellir National Park, stopping to photograph Icelandic horses, an old farm building, snow patterns on the mountains and the Oxarafoss waterfall. Rain and cloud. This made shooting the geyser against the light easier, so I repeated the attempts of the previous day. I re-shot the close-ups of the mineral deposits more carefully using a tripod to avoid camera shake. Travelled on to the town of Vik on the south coast. On the way, we stopped at the spectacular Gullfoss and Skogarfoss waterfalls. Both needed people in the picture to give a sense of scale. For some shots I used a polariser to slow down the shutter speed by 2 stops. (I have just bought a 77mm 3 stop ND8 filter to use in future). More pictures of farm buildings, horses and patterns on the mountain sides. Photographed black boulders and ice patterns at the edge of a glacier (Myrdalsjokull). Black sand and surf on the beach at Vik along with some rusty sheds and the famous red roofed Vik church. Drove on to the glacial lake at Jokulsarlon. On the way, photographed moss covered lava fields, waterfall and barn on a hillside and grasses against black sand. Returned to the glacial lake after dinner for some evening shots. Lost one of the feet off my new Gitzo tripod (rats!). Got up early and went for a stroll, accompanied by the guesthouse Collie dog. Found some old farm machinery near the beach so went back to get my camera. Drove back to Jokulsarlon and spent the day shooting ice at the glacial lake and the small icebergs washed up on the black sand beach. Photographed an abandoned farmhouse on the coast near Borg. The farmhouse was surrounded by inquisitive horses that liked to poke their head through the open window frames. My attempts to photograph them framed by the windows failed because of highlight burn-out from the bright sky. I should have used the D200 built-in flash. Inside one of the rooms was a photogenic ancient cooker complete with empty glass bottle on top. Had it been placed there by another photographer before us? Later we drove up a long un-surfaced track to the edge of another glacier. There was a fairly long walk over soft mud to get to the ice. Two of the group ended up with boots covered in mud. I found an emerald green rock that I later identified as malachite - semi-precious copper carbonate. As we re-joined the main road we stopped to photograph more horses with mountains in the background. Soon after we discovered the glacier track had taken it's toll on the tyres and we had a major blowout. We managed to jack up the bus up remove the wheel nuts but the wheel itself would not move. Eventually a mechanic from the local garage at Hofn arrived with a large hammer and managed to fit the spare wheel. We followed him to the garage where they luckily had a replacement tyre for the spare. Got up early and shot a series of images of the mountains around the inlet at Djupivogur with the idea of stitching them together to create a large high-res panorama later. Then we drove North for Vopnafjordur. The forecast was for snow and high winds. We stopped at Faskrudsfjordur on the coast to photograph an old hospital built for French Fishermen in 1903 and later used as apartments before being abandoned. The decay inside the building made for some interesting images but the photography had to be cut short because we were worried about difficult travelling conditions ahead. As we drove up into the mountains, the cloud came down and the snow began. The snow got worse and soon became a total whiteout. We considered turning back but pressed on as far as Egilsstadir. There we were advised not to travel further until the following day by the local Tourist Office. The girl at the Tourist Office managed to find us overnight self catering accommodation in the town. The ladies in the group cooked us a nice meal of Arctic Char and salad which went down well with 3 bottles of wine. The snow had started to melt and we continued North heading for Myvatn. The snow made for some fantastic mountain scenery. Photography was difficult because of very strong winds. It was impossible to use a tripod. We worried about the minibus door being blown off it's hinges. Sometimes all we could do was shoot out of a window. Because of the wind, I ended up with an annoying dust spot on the D200 sensor after changing lenses. This was very visible against the white snow on several frames. I managed to clear the dust with air from my blower brush later at the hotel. Photographed mud pots and fumeroles at Namafjall near Myvatn. Boots ended up caked in sticky orange mud. We tried to get to the Mount Krafla volcano to photograph the blue water lake in the crater but the snow was too deep. The minibus got stuck in the drifts a couple of times. Instead, we climbed to the rim of the crater of the Hverfjall volcano. This has a dry lava mound in the center rather than a lake. The long 250 mile drive west to Reykholt took most of the day. We stopped to photograph Godafoss and the smaller Geitafoss waterfalls on the way. We had some fantastic light on the snow covered mountains near Akureri during the morning. The continuous rain during the second part of the journey was not a big problem as the scenery in that area was pretty bland. Photographed the small timber church near the hotel before heading to Reykyavik. Stopped on the way to photograph the Barnafoss waterfalls. We only had a couple of hours in Reykyavik. We photographed the brightly painted timber buildings and graffiti in the old part of the town. I took a few wide-angle shots of the famous viking ship sculpture. We then drove east to the hotel situated near a geothermal station near Pingvallavatn lake. Photographed the red roofed church by Pingvallavatn lake on the way back to Keflavik airport to drop off two of our party who were flying back a day early. Then drove south to the fishing port of Grindavik. Stopped off at Hafnir to photograph large waves breaking over the rocks by shooting through the minibus windows. The small black church there was locked and it was too windy to photograph the outside. Grindavik was a bit more sheltered and we photographed a disused industrial site with old gas holders, pipes, rusty valves and graffiti. The poignant message 'Grindavik is a lonely place' was scrawled on one wall. In the morning we found time to photograph the cyan coloured pools at the famous Blue Lagoon health center and the hellish looking scenery around the Reykjanes geothermal power plant. We managed a few final shots in the Keflavik airport building before the flight home. I visited Claydon House, near Winslow on Easter Bank Holiday Monday but didn't take my camera - no photography allowed inside. However, I spotted an interesting looking lych gate (Victorian?) on the way back through Middle Claydon. I made a return visit the following morning with my infrared kit and managed to get a couple of atmospheric shots, despite the sun being in the wrong place and having to set my tripod up in the middle of the road. The camera still had a half used roll of Kodak HIR inside from my July 2008 trip to Norfolk. Not surprisingly, the first part of the roll that was left on the take-up spool was quite badly fogged. The second unexposed half that remained protected inside the cassette was not too bad. The roll contained some images of the Abbey ruins at Walsingham. I managed to salvage a couple of frames but the Abbey images were not that good. The clouds on that day were not ideal for infrared. February brought snow chaos. Being unable to get to work meant there were some good winter photo opportunities.